They have red-tinted hair instead of grey, eat fish along with meat and love to island-hop. 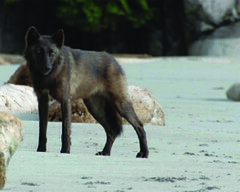 That makes coastal wolves, found from Vancouver Island to southern Alaska, unique in behaviour, looks, diet and genetic makeup, an international study has found. The Raincoast Conservation Foundation study, led by Violeta Munoz-Fuentes of Uppsala University in Sweden, with collaborating scientists from the Smithsonian Institution, University of Victoria, University of Calgary and University of California, will be published in this month’s Journal of Biogeography. “They are like no other wolves. The genetic differences are striking and their ecology is very, very different. It’s so cool,” said Chris Darimont, of the University of California, Santa Cruz, whose UVic doctorate is on wolf populations. After five years of collecting wolf droppings, then studying genetics, scientists found coastal wolves have adapted to the temperate rain forest environment and have evolved into a different type of animal from their grey-coated cousins across the Rocky Mountains or their Arctic relatives. “It shows statistically that genetic differences are driven by a different ecological environment,” said Darimont, who believes that makes a case for much stronger protection of B.C.’s coastal and old-growth forests. Coastal wolves should be recognized as an Evolutionarily Significant Unit that deserves protection and special conservation status, the study concludes. Instead of relying on large deer or elk, like other wolf populations, coastal wolves have only small, black-tailed deer on their meat menu, so they turn to seafood. “They eat spawning salmon, beached whales and even kill seals and seal pups. They are so adaptable and such smart creatures. They know how to make a living off marine resources,” Darimont said. “They are truly island wolves. They swim between foraging patches on islands, such as in the Broken Group or Clayoquot Sound. We are saying, tongue-in-cheek, that this is our newest marine mammal,” Darimont said. Coastal wolves are smaller than other populations and many have a browny-red tinge. “They blend perfectly into the reddish brown algae on the coast. They look as if they’ve been dipped in reddy-brown paint,” Darimont said. No accurate figures are available, but there are probably “a couple of thousand” coastal wolves and they face increasing threats from loss of habitat, depletion of salmon stocks and trophy hunting, he said. Paul Paquet, one of the study’s authors, describes some wolf habitat in B.C, including much of Vancouver Island, as a “wilderness ghetto” with tree farms instead of old-growth forest and roads intersecting forest, meaning increased hunting and trapping. Resident hunters require no special permits for wolves, with a limit of three a year, and trappers have no bag limits. “It’s laissez-faire management dominated by hunters,” said Darimont. Environment ministry spokeswoman Kate Thompson said staff have not yet had a chance to review the study.